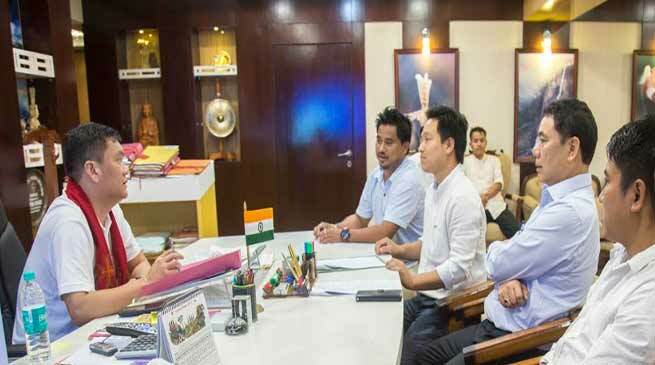 Members of Adi Students Union (AdiSU) called on Chief Minister Pema Khandu today to discuss on the status of Arunachal State University at Pasighat. Chief Minister Pema Khandu informed that state government is taking all necessary steps to make Pasighat University fully operational. To discuss the way forward, he informed that the matter will be discussed soon with the state education ministry. Informing on steps being taken, the CM said the state government has sanctioned Rs 5 crore for construction of boundary wall for the University whose work has already been completed. He also informed that consecutively in the last two financial years, Rs 10 crore and Rs 15 crore has been announced in the annual budget of 2017 and 2018 respectively for the development of infrastructures in the University. AdiSU members were accompanied by Health Minister Alo Libang.